High tension cable kills thirty football fans in Calabar – Royal Times of Nigeria. 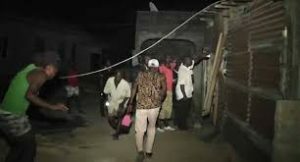 No fewer than thirty people lost their lives in Calabar, the Cross River State capital on Thursday night after a high tension cable fell on them at a football viewing centre. The football fans were said to have assembled at the centre to watch a UEFA Europa League quarter-final match between Manchester United and Anderlecht on satellite television. Report says that the live electricity cable broke from its mooring and fell on the viewers. 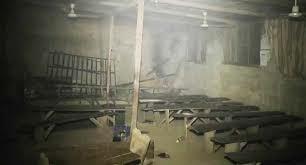 A survivor said a transformer near the viewing centre located in the Iyang-Esu area of Calabar municipal local government area, exploded during the match. He said this caused a high-tension cable to drop on the viewing centre. Another witness, who said he was the first to run out of the viewing centre, told newsmen that the victims died as a result of a contact between the live cable and the roof of the viewing centre. Electricity authorities said it is illegal to erect any building around areas with high tension cables.